​​​​ IRVING – Blue Star Land LP and Lincoln Property Co. are gearing up for a major mixed-use project. 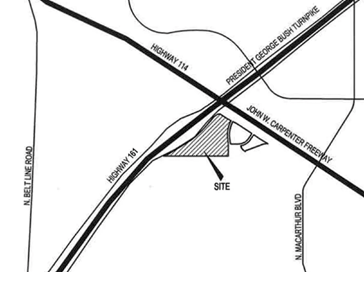 The almost 28-acre project is planned at the south corner of SH 114 and SH 161. Plans filed with Irving's zoning commission say the development will include a hotel, retail space, and apartments. Lincoln will build 288 apartments in the Las Colinas development on Meridian Dr. east of SH 161. The hotel and retail site is to the north along High Point Dr. In addition, a community park is planned at the center of the development. ​​Check out DFW Hotel, Multifamily, and Retail Market Research.